154 Hidden Court: Teaching my kids to receive gifts graciously. Teaching my kids to receive gifts graciously. Once fateful Christmas day when he was not quite three, Zack tore open a Christmas gift from some relative or another and immediately blurted "BUT I ALREADY HAVE THIS! Is there anything else for me?" I shushed and covered and all that, but the damage was done, and for someone like Zack who is really, truly, painfully honest, he couldn't understand what he did wrong. He DID already have it, and why shouldn't he be able to say that out loud? Since then, I've made a point to talk to my kids often about what it is or isn't ok to say when receiving gifts, and we have a crash refresher course before every gift giving holiday like Christmas and birthdays. Has it been 100% effective? Of course not. Like most of parenting it's totally trial and error as to what will stick and what will wash away like the crumbs of yesterday's chocolate pie, but I've talked to my kids about this SO much that I feel like we are worlds ahead of where we used to be. I let my kids be in on the selecting and giving of gifts for others. My kids get to pick out (with minimal interference from me) gifts for each other, gifts for their dad, gifts for their friends and extended family. Sometimes they hit it completely out of the park, and sometimes they pick out orange body glitter for their middle aged aunts (true story), but by going through the process of selecting and giving gifts for others, they learn empathy for what the gift giver goes through for them. Both my boys LOVE giving gifts and I love hearing them talk about how much so-and-so loved the whatever-it-was that they chose. It's a subtle lesson for the art of graciously receiving gifts, but an important one, I think. I teach my kids to always look the giver in the eye and say "thank you." This seems like a no-brainer, but I continue to be amazed at the number of times people - even adults - don't extend this simplest courtesy. I have probably prompted my kids a million times, "What do you say?" when they are given anything from an elaborate gift to a drink of water, but I'm happy to say that it's finally starting to stick and I have to prompt them less and less often now. A simple "thank you" really does go a long, long way. I tell my kids to pick one nice thing they notice about a gift and to comment on it. If Aunt Margaret hands them a horrid lumpy sweater, they can comment on how warm it looks. If Uncle Jim-Bob gives them a well used shirt six sizes too large, they can talk about how blue is their favorite color. What I try to teach my kids is that if someone takes the time to choose something for them, then that means care and time and effort went into it. I don't want my kids to lie. I absolutely don't want them to gush about how much they love something if they really don't. But... there are positive qualities to everything, and it's a good life skill to be able to see those things and call them out. I teach them not to comment about negative things. This is another one that might seem like a no-brainer, but when you're dealing with ridiculously outspoken and honest kids like mine, it's worth talking to them about it (repeatedly). If they hate it, if it won't fit, if they already have it... these are things the gift giver doesn't necessarily need to know. Now it's a totally different story if the giver asks specifically "Do you have that already?" or some such, but what I try to convey to them is if you can't say something nice, don't say anything at all. I'm trying - every day - every single day - to teach them there is more to any holiday than receiving mountains of stuff. My kids have so much - TOO much - and they will get mountains more. But when I talk to them about holidays, I stress the other parts - getting together with family, giving to people less fortunate than us, enjoying time together doing fun things. 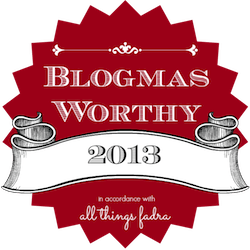 Christmas is about so much more than THINGS, and I don't want that to get overlooked in the mad rush that Christmas has become. Good manners are important to me, and being able to graciously receive gifts from others is becoming a lost art form. I cringe a little when I see people - children and adults - who are unable to utter even a simple "thank you" when they are given something. I want to ensure my boys grow up knowing that these little niceties are not just important, they are necessary. I have prompted them a million times to say "thank you" and I'm sure that before they are adults I will do it a million more, but the more they say it, the more it become a habit, and that's just the kind of habit that I want to help them build. 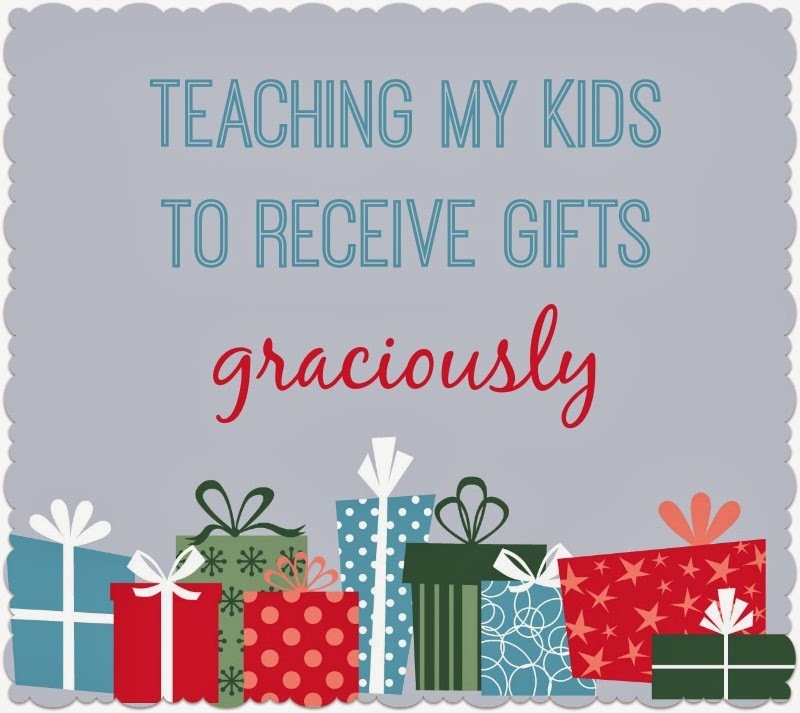 What do you do to help your kids receive gifts graciously?